The Rotabloc fully protects your No-Break (Critical) Loads and any excess Engine Generator power is available for the protection of any Short-Break (Essential) Loads. 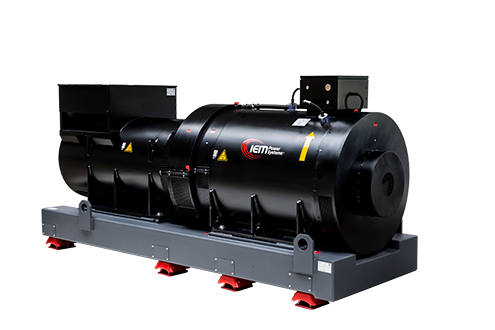 IEM Power Systems offer our Rotabloc RBT as a component to be integrated into your existing system design or as a fully integrated uninterruptible power system. In our unique approach to DRUPS the Rotabloc Energy Storage Unit, Switchgear and Diesel Genset can be built, tested and supplied as a fully integrated solution. Units are typically combined to form larger systems to protect installations including Data Centers, Banks, Defence, Research Projects, Hospitals, Industrial / Manufacturing Facilities and Air Traffic Control Centers. The overall power distribution / protection system can be linked to the BMS so that the UPS can be managed as part of the overall facility. The advantages of the integrated IEM Power Systems approach include reduced project risks associated with combining disparate components, and minimized vendor management issues. Market leading operating efficiencies (up to 97%) are achieved using Dynamic Speed Control, matching the speed of the Flywheel to the applied load. Other Rotary UPS systems employ Utility (Mains) power to drive the flywheel directly, this makes it impossible to vary the speed of the flywheel to match the energy storage requirement. Typically, the approach of our competitors results in their flywheel being maintained at too high a speed, wasting energy and creating unnecessary wear on components. Rotabloc’s Dynamic Speed Control automatically balances the changing power demands of the Critical Load and the energy stored to maintain it, optimizing energy use and maximizing efficiency. Unlike any other UPS manufacturers, IEM Power Systems backs its promises and underwrites its efficiency figures. Unmatched TCO figures – Lowest Capital Expenditure and Reduced Operating Costs. Highest Efficiency – Supports your facilities ‘Green’ credentials. Compact Footprint and Flexible System Configuration – Increases revenue earning space. U.S. and European Manufacturing and Maintenance bases – Provide ‘local’ service. Reduced Risk – By providing full factory system testing – Rotabloc maintains site safety, minimizes risk and reduces installation costs. Only IEM Power Systems can provide a DRUPS with all of these advantages together with highly competitive system pricing.